Famed for their Jogo Bonito football I feel that sometimes people underestimate the quality of defenders that the country produces so I was on a mission to have a look at a few central defenders and wing backs that could possibly become a young violet in the futur but it was during that first game that I watched I came to notice a second half Gremio substitute called Ganso who at the tender age of 15 displayed 20 minutes of magic in scoring the first goal of the game and then assisting the second that gave Gremio a 2-0 win. Immediately I assigned my scouting team to take a closer look at the young winger sporting a white head band that sweeps his flowing locks away from his face that resembles a young Ronaldinho, I need to know more about this boy and I leave Porto Alegre with a picture in my mind of a young skinny framed boy in a baggy fitting Gremio shirt. Born in Porto Alegre on the 11th July 2004 an only child to father Wilson da Silva a medical doctor and mother Martha Machado a dental hygienist, Wilson ‘Ganso’ da Silva started his young life in a wealthy household. Ganso was a privileged child but at the tender age of just 5 years old young Ganso’s life was to take a very different direction than the one planned out by his parents when on one tragic evening a fatal car crash robbed the youngster of both his parents and his privileged upbringing. Ganso with no other family was taken in to the care system spending the next two years bouncing from foster parent to foster parent before a long term fostering family took the young boy under their wing. Unlike Ganso’s parents wealth his foster parents Luiz and Maria Pereira lived a modest family life with their 10 year old son Gilberto. Luiz worked with a public transport company whilst his wife worked part time in a local grocery store. For the first time since the passing of his parents at the age of 5 years old Ganso had finally got some stability in his life. The youngster had found life difficult being passed from pillar to post from family to family and from school to school it was such a difficult time for one so young. The Pereira household gave Ganso a loving home. Both Luiz and his son were both Gremio supporters and also followed their national team with pride. Gilberto played for a local club called Atlantico FC who had a youth team and junior team, Gilberto was an aspiring goalkeeper like his father was in years gone by. Ganso started the same school that Gilberto went to and did not find it easy to start with but with Gilberto by his side he started to settle in to his new surroundings. Both Ganso and Gilberto would walk home from school together and once home they would soon be outside kicking a ball around. Gilberto would go in the makeshift goal whilst Ganso would take shots at him. Ganso like any other youngster in Brazil loved the ball and developed well playing the game at school. Ganso would go along with his foster father Luiz to watch Gilberto play for the Atlantico U12 side on a Saturday morning and after watching Gilberto for a full season young Ganso himself joined the Atlantico U10 side managed by a football mad man simply known as Tosto who took Ganso under his wing. Tosto worked at the same transport company as Luiz and offered Ganso a trial after speaking to Luiz one day. Ganso looked out of his depth during his trial match with the Under 10 side however Tosto noticed the determination and pace that young Ganso possessed and offered him a place in the squad for the forthcoming season. Ganso was over the moon and raced home in front of Luiz to break the news to Maria and Gilberto. The change in Ganso over the coming months was incredible it was nice to see for everyone in and around the boy from Porto Alegre who suddenly seemed to settle in to his new life, he was a bright kid but his teachers at school noticed the change in him and it was all down to him being chosen to be part of the Atlantico U10 squad thanks to the eye of Tosto. The first season 2012 an 8 year old Ganso played little part in the starting line up making around 8 or 9 substitute appearances for the side but Ganso was loving being part of the team and would look forward to practice on a Tuesday evening and then Matchday which was mainly on a Saturday morning. Ganso became good friends with the captain of the Under 12 side Eder who also went to the same school that Ganso attended. Eder was a big lad for his age and played in the centre of midfield, he was a popular kid at school and looked the part, he would stroll around the pitch keeping the ball moving, he stood out from the other boys because of his size. The dark haired captain was also popular with the girls at school he was an handsome young man but girls would also come 2nd to football. He and Ganso would watch the Gremio games on tv each weekend either at Eder’s home or at Ganso’s home. Luiz would sometimes get a few match tickets for the Gremio home games and take Gilberto, Ganso and Eder to the games. The 2013 season saw young Ganso get a few more starts but it was the 2014 season that a 10 year old Ganso became a regular in the starting line up playing on the left wing a position that the young boy was making his own with consistent performances week in week out. The Under 12 side finished 3rd in the table and young Ganso was voted the managers player of the year. Ganso stayed with Tosto and his Under 12 team for two more seasons before moving up to the Under 14 squad managed by a man called Ramon Silva who was a real football man who could talk all day long about the game. Mister Silva was a well known character amongst the local community and had built up links with a lot of the scouts working in and around the Porto Alegre region. The 2016 season was an interesting one for Ganso after he picked up an injury to his right ankle he would sit out 2 months of the season. Ganso was now in secondary school and doing well with his studies and also representing his school in the school Football team and Futsal team. It was whilst playing in the Futsal team that Ganso was spotted by a Gremio scout and invited to attend a trial day that would take place in the spring of 2017. Ganso was over the moon and it showed in his performances on the field for the Under 14 side who finished the season in the runners up spot and with Ganso top scoring with 18 goals. Ganso is somewhat of a perfectionist a trait that took after his real father Wilson da Silva. Everything that Ganso does he does it with care and sometimes it becomes a problem to him when others are not as bothered about things. Ganso was now taking great care of his appearance sporting shoulder length hair he was groomed very well and was also starting to get comments about his resemblance of former Gremio player Ronaldinho that earned him the nickname ‘Gaucho Junior’ Ganso was proud of the comparison and it was not long before he started to sport an hairband to hold his flowing locks in place. The spring of 2017 was soon upon and Ganso was enjoying life he was a popular kid at school and he was enjoying his football. The trial day was less than a week away when Ganso suffered a slight ankle sprain running home from school turning his ankle on a bit of wasteland on his journey. Ganso pulled out of the coming weekends game with the Atlantico FC U14’s to rest his ankle ahead of the trial day at Gremio. Ganso attended the U14 game and unbeknown to him he was the talk of the town amongst Atlantico and their rivals with the opposition manager enquiring which one is the boy from Porto Alegre who is to trial at Gremio next week? Ramon Silva was unsure why so much interest from the opposition manager and thought maybe that they wanted to single him out for some extra treatment. Ganso nursed his injury right up until the day of the trial. Foster father Luiz strapped the young lads ankle up ahead of the trial. Young Ganso joined a crowd of young lads all waiting in anticipation at the gates of the training ground of Gremio, some had travelled far and some were recognised from playing in the youth league’s. There was a sense of nervousness in the atmosphere whilst the boys waited for someone to meet them which was not long. Grêmio head of youth development Francesco Garcia Barletta was the man to greet the boys and take them in to the dressing room area of the Gremio complex. Ganso was feeling nervous like I am sure the other lads were. Barletta addressed the boys to tell them that they would be playing against a Gremio youth team and that Gremio’s U20 assistant manager João Antônio would be looking after them during the course of the trial. There was 18 boys sat in the changing room all listening to Barletta. Enter João Antônio “good morning boys” Antônio had a team sheet already and Ganso was on it playing on the left side of a front three. The boys all got changed and made their way out on to the pitch, awaiting for them was a team made up of Gremio youngsters. Ganso looked nervous and gave a wave over to an area that parents and on lookers were gathered amongst them Luiz and Gilberto who were here to show their support for Ganso. The game kicked off and after the first ten minutes it was not difficult to spot the organisation of the Gremio boys who were dominating the game, Ganso had not had a touch and then in the 14th minute he burst in to life after a long clearance cleared the Gremio right back Ganso raced on to the ball and dribbled first inside and then back to the outside that took him to the byline to swing a dangerous cross in to the the path of one of the trialists who headed narrowly over the bar. The Gremio officials had reached for their notebooks Ganso had made an impression and it was greeted with a ripple of applause from the group of parents. The game was all square at half time at 0-0 and coach Antônio made a couple of changes to the line up and called Ganso over, Ganso thought his time had come but the Gremio official gave him a few words of encouragement telling him to try and drop deeper and to demand the ball. Ganso felt good inside and translated what he had been told on to the pitch within minutes of the restart he came deep got the ball and dribbled past the right back laying a quick ball off to the tall centre forward by the name of Edu who played a one-two with Ganso before unleashing a powerful shot that was saved by the Gremio keeper. Ganso got the ball again and again he turned the full back inside out however his foot seemed to stick in to the turf Ganso let out a cry crashing to the ground his game was over the young winger had torn his ankle ligaments confirmed by the local hospital some hours later. What a blow for him just at the time he was feeling comfortable and getting more and more of the ball. After the hospital visit Luiz received a call from Barletta the head of youth development to check in on the welfare of the young winger also saying that Ganso had impressed the Gremio coaches however he was not selected for this year’s intake but they would like to invite him back next year. It was a blow for Ganso but he was strong boy who had dealt with bigger blows in his earlier life. Ganso was unable to play football for nearly two months but after his recovery he was just about ready for a return to game when he was suddenly struck down by an illness that hit him like a truck. Ganso a fit young athlete could hardly walk 20 metres before being out of breath, it was the start of a six month process of allergy tests and so on ending in the diagnosis of Asthma. Ganso had been through a torrid six months with the illness taking a lot out of him but with the aid of an inhaler he was on the road to recovery. Ganso had not played football for the best part of a year whilst dealing with his medical problems. The summer of 2018 saw Ganso get back to training this time with the Atlantico U16 squad managed by a familiar face in Ramon Silva who had managed the U14 side previously. Training for Ganso was a welcome return to fitness and he needed it because he was now going up against 16 year old boys who were a lot more physical than what he had faced before. Ganso forced his way in to the starting Xl and was performing better than ever, the Ronaldinho lookalike was setting the U16 league alight, it was an incredible turnaround for the lad who was drawing attention again from Gremio. Ganso was offered a second chance with Gremio after his name had popped up time after time from the scouting network who followed the Brazilian youth leagues closely. There had been a substantial boost for the clubs junior budget in recent times. Ganso had been invited to the clubs annual youth intake trial match that would take place at the clubs training ground. Ganso was feeling a little nervous but unlike the other boys he had experienced this before and was better prepared mentally. Like last time Ganso was in the starting Xl to go up against a Gremio youth side. The coaches knew of Ganso and he was made to feel welcome which made the young pretender feel good about himself. It didn’t take the Ronaldinho lookalike to make his mark with an excellent first touch young Ganso cut inside from the left and unleashed a power driver in to the top corner of the net shaking the goal with the power. Ganso was on top of his game and just before the break he provided a neat cut back assist that put the trialists 2-0 up. The Gremio coaches had seen enough to give Ganso a chance and put his name forward to make the cut. Ganso played another 20 minutes in the 2nd half before being substituted. Ganso joined Gremio on a youth contract and the young winger was about to embark on a new chapter in his life. Ganso settled in to life at Gremio and whilst playing for the youth teams improved both on and off the field gaining a good education. The Ronaldinho comparison continued for he was looking more and more like the famous ex Gremio player in looks but had plenty of work to do on it to match the maverick himself. A trip by myself to Brazil like I said in the opening lines above was the first I knew about Ganso and so I sent my scouts to track him over a few months and then again for the next couple of years before making a £2m offer to Gremio for the then 17 year old which they accepted. 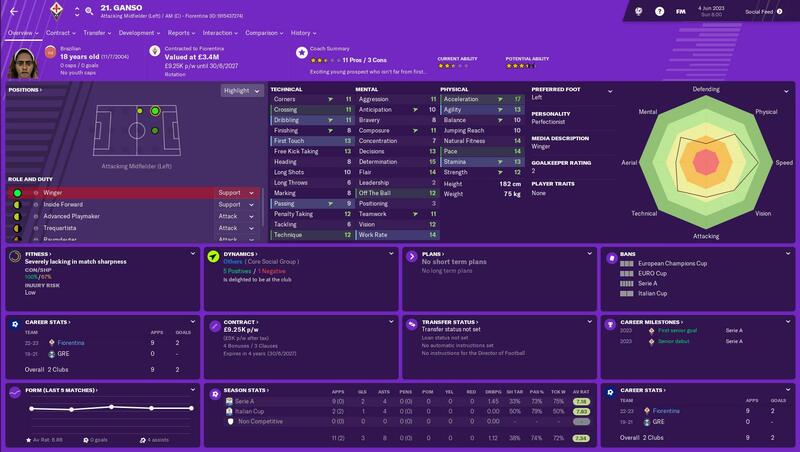 Ganso joined us in January 2023 and would go straight in to our Under 20 squad but an injury crisis during the next month ment that the Boy From Porto Alegre would come in to the 1st team squad for the rest of the season. Without giving anything away before I release my season 5 review all I can say that in 11 starts and 2 substitute appearances Ganso scored 3 goals and had 8 assists. Welcome to Florence!!!! That concludes this current blog post so if you are reading this I would like to thank you for taking the time to check out my blog. I thought that I would mix things up a bit away from the usual save updates that I usually write about and create a bit of a background story to a newgen. My next post will be a save update that will cover the end of season 5 with the Viola. I also plan on doing a post that covers the youth teams performance over the last 5 years. I will be using my FM Base thread to share some extra content in the future before releasing it on my blog so keep yours peeled for that. I would just like to end with a big thank you to all that take the time to visit this blog and hope that you are all still enjoying the game in the FM World.